In July this year, two outstanding MDHS researchers – early career researcher Dr John Karas (Department of Pharmacology and Therapeutics) and PhD candidate Lisseth Burbano-Portilla (Florey Department of Neuroscience and Mental Health) joined 26 PhD candidates, post-doctoral researchers and clinicians from around the world in attending a 14-day International SPARK Biomedical Innovation and Entrepreneurship training course in Berlin. SPARK, a global initiative stemming from Stanford, aims to advance biomedical research discoveries into promising new treatments, by fostering the next generation of biomedical entrepreneurs. SPARK emphasises new ways of thinking to bridge the gap between bench and bedside. Delegates were exposed to a series of lectures and workshops that focussed on topics such as drug discovery, biomedical device design, intellectual property, regulatory science and biomedical start-ups. They were also tasked with developing a mini project which culminated in a mock pitch to venture capitalists. Lisseth Burbano-Portilla agrees. 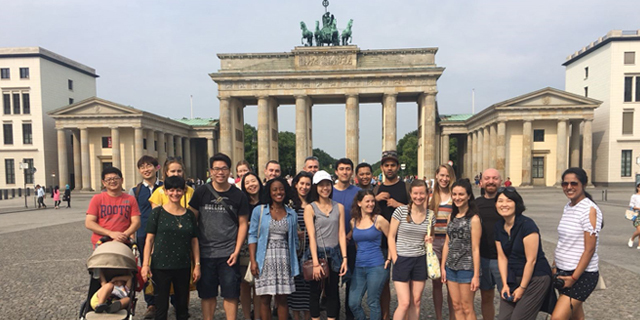 “The idea of creating a community of clinicians and scientists without borders is one of the key elements of SPARK Global and during the course there were plenty of opportunities to connect with both lecturers and students”. The Faculty is piloting its own SPARK program next month which will provide education, mentoring and funding to promising projects. The recipients of the inaugural Dean’s Innovation Grants will be its first participants. For more information about SPARK or to find out what the Faculty is doing to help researchers realise their ambitions in research translation and/or commercialisation, please visit Innovation and Enterprise. Upcoming opportunity: TRaMx workshop – want to learn more about research impact and need a point in the right direction? Register your interest here.